We are now able to accept online e-check and credit card payments through this safe and secure option that you can use 24 hours a day in order to make your licensing renewal payments. All you need is your Renewal Application, payment information and just a few minutes of time. 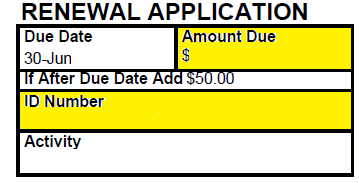 A late fee of $50.00 must be added to each license renewal fee after June 30th. The late fee does not apply to DNR – TNC or Water Testing fees. If you have any questions please contact us at 715-261-1900. For instructions on how to complete an online payment, see the information below. Type your ID Number, Establishment Name and Amount Due per your Renewal Application. If you have any change in your contact information please include the new information in the Change of Address or phone number area. If you have more than one license to renewal select “Add another item to your cart” to include multiple ID numbers, Establishment Names and Payment Amounts. If you have any questions or need any assistance please contact us during our business hours of Monday – Friday, 8:00 a.m.-4:30 p.m. at 715-261-1900.